For places of worship, safety is assumed upon entering. Worrying about an active shooter is not among most people’s thoughts as they enter their religious community. Because of this, church security and emergency preparedness has to be something that religious leaders take into consideration as the day to day operations of their churches are carried out. Places of worship are highly visible in their communities, and their leaders can be viewed as the embodiment of inflammatory political issues – placing them at heightened risk. Typically, places of worship are seen as a sanctuary or safe haven, but the reality of today is that places of worship are just as vulnerable to active shooter events as schools and businesses. Generally there are very low measures in place for detecting threats. The ALICE Training Institute can offer on-site assessments and training to help you plan and prepare for a day we pray never comes. Whether you are an individual, a family or on the leadership team on a congregation, we’ve got you covered! Become individually certified in ALICE through our e-Learning course based on up to date active shooter response protocols. In the incidents studied by the FBI, 50% took place at Places of Worship on a Sunday. Specifically, just six events resulted in 21 people killed and 27 wounded. The ages of the shooters ranged from 24 to 69. Certify Ushers, Greeters, Child Nursery Attendants, Teachers, and Servers as part of your Safety Program. Most volunteers at a House of Worship have little or no background in security activities including what to do during an active shooting event. They are typically friendly, always smiling, shaking hands, directing guest and passing offering plates. Today, greeters, ushers, deacons, ministers, teachers, pastors all share responsibility for the safety and security of the congregation. 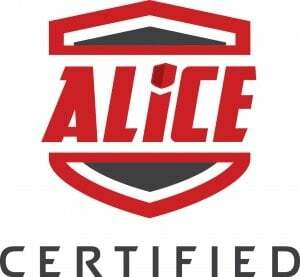 ALICE certification can help build that basic training. Over 3,000,000 trained. Let’s see what Some have to Say! Contact one of our Program Directors to Learn More.